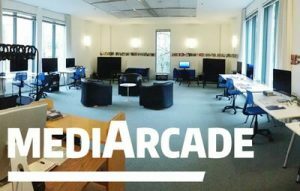 students | What Is A Media Lab? NT: What is your lab called and where is it? NT: What sorts of projects and activities form the core of your work? Is there a specific temporal or technological focus for your lab? develop new kinds of insufficiently conceptualised and critiqued demonstrations of technical prowess and gimmicky computational affordances doomed to swift obsolescence. We want the dog to wag its own tail – happily and excitedly, and in ways that can energise and contagiously enthuse others. Lara Stein Pardo is a cultural anthropologist and visual artist currently working as a Research Associate in the Laboratory for Race and Popular Culture (RAP Lab) at University of Colorado, Boulder. EA: Lara, I want to start by thanking you for taking the time to speak with me and to explain to our Digital Humanities class about your work. As you know, I’m incredibly interested in your Mapping Arts Project, which has led to some interesting developments in my own pedagogical aspirations. Could you tell us a little bit about what the Mapping Arts Project is, and where it is headed? LSP: The Mapping Arts Project is a primarily web-based project that maps cities through places where artists have lived and worked historically. The project is online at mappingartsproject.org, and includes Miami and Providence so far. Denver and Chicago are in development. The project includes archival, spatial, artistic, and ethnographic research and materials. Future plans include continual technological improvement such as the use of mobile locational technologies and the redevelopment of the website to show a global map (vs city maps). In the Spring I’ll be working with students in the course, “Geographies of the Arts,” to launch Mapping Arts-Denver. EA: Could you explain what started the project? What were some of the biggest challenges (knowledge of coding etc., economically, gaining interest, etc.) you faced, and ones you may still be facing, when you started this? LSP: I started the project in 2009, while doing ethnographic fieldwork for my dissertation on contemporary arts. I wanted to find a book that would tell me about the history of the arts in Miami. I could not find such a book. Instead, I began to conduct archival, ethnographic, and historical research. At first, I thought the project would be a short-lived participatory art project. But, the more research I did, the more I realized it needed to be a bigger project. That’s when I designed and developed the website – to be able to create a broadly accessible and continually growing project. Some of the biggest challenges in the beginning were time and funds to do the initial web development. Oh, also, finding the right team to work with. I have kept the project manageable thus far. Eventually, I will need to raise funds again to expand the technological capabilities of the project. Although students come in thinking they will write essays, the lab’s milieu is that an essay (for example) is a process of “making” with words. Once we recognize it as a making, we can experiment. Adrian Miles is a senior lecturer in New Media at the School of Media and Communication at RMIT University in Melbourne, AU. He is program manager at the Consilience Lab and co-director of the non/fiction lab at RMIT. It’s called the consilience lab. It is at RMIT University in the School of Media and Communication, Melbourne. What sorts of projects and activities form the core of your work? Since we are a school of media and communication, and 70% of the students do it by project, there is often a ‘technological’ focus. The lab is a degree program so has a curriculum. We have a common research class (methods, etc), and three thematic labs lead by researchers. For the past three years one lab has revolved around media materialism (using Alien Phenomenology as the introductory reading). This is the most tech of the three thematic labs we have offered. John Vallier is Head of Distributed Media Studies and an affiliate assistant professor of Ethnomusicology at the University of Washington. – it’s a roundabout reference to Benjamin’s The Arcades Project.